Beasts & Bottles is a neighborhood restaurant that focuses on providing a high quality experience with locally sourced ingredients. Located in our old neighborhood, Historic Brooklyn Heights, Beasts & Bottles specializes in flame rotisserie cooking combined with the techniques of Provence, France. Their old fashioned flavor is accented by a farmhouse-chic setting that is relaxed, warm, unpretentious and elegant. Based on the successful brand Project 13 created for Atrium Restaurant, owner and Master Sommelier Alexander LaPratt brought us in to brand his newest venture – Beasts & Bottles. We set out to create an iconic and uniquely recognizable brand that places emphasis on both their locally sourced food offerings and carefully curated wine program. 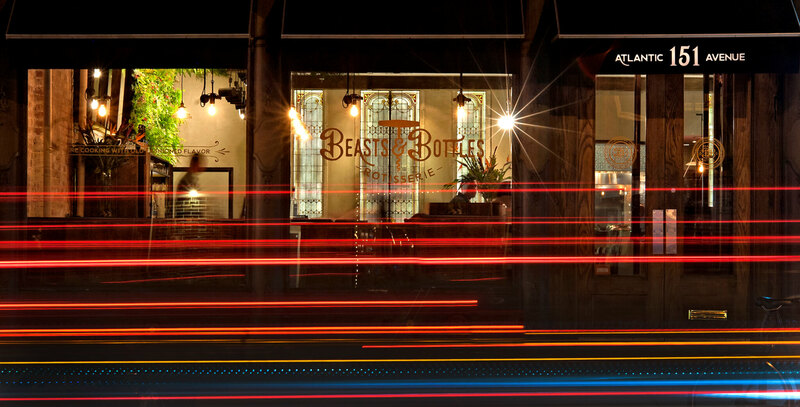 Beasts & Bottles’ logos, interior and exterior signage, menus and web site were crafted to cohesively express the many nuances of this lovely new gem which is filled with character, charm and outstanding food and wine.